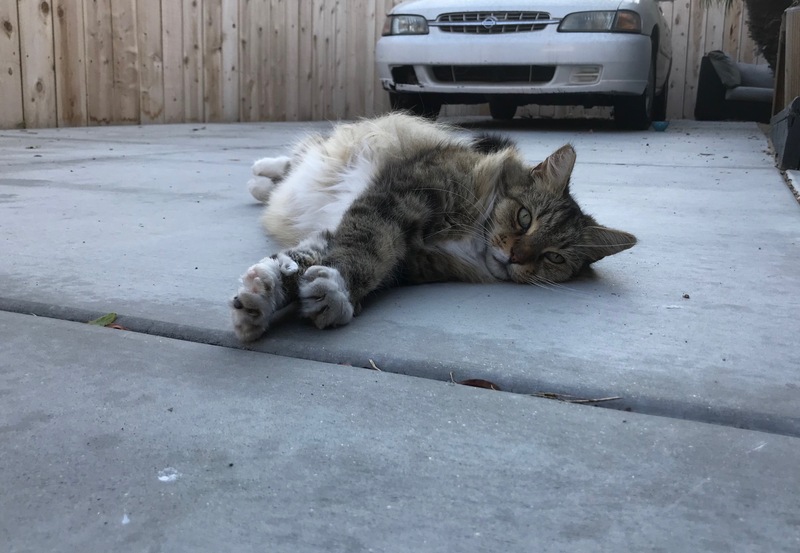 Friendly, feisty feline Fess is missing! His owners started postering his disappearance on Aug. 5, 2017. I last saw him about 7:25 p.m. PDT on the second, sitting way out into the sidewalk gutter of his apartment complex driveway; no one has reported seeing him since. Given that he is my neighborhood favorite, and needing to relax-the-mind walk following my mother’s death two days ago, I have looked all around for him—yesterday twice meeting his owners doing the same. Fess has a new collar, which I used as excuse for a July 22nd Caturday mini-pictorial. My heart stopped, or so it seemed, last night while searching the alley between Campus and Monroe—well within Fess’ territorial range. I came across a long hair that lying flat reminded me of him. The animal let me approach and lift up collar tag to reveal Sophie. 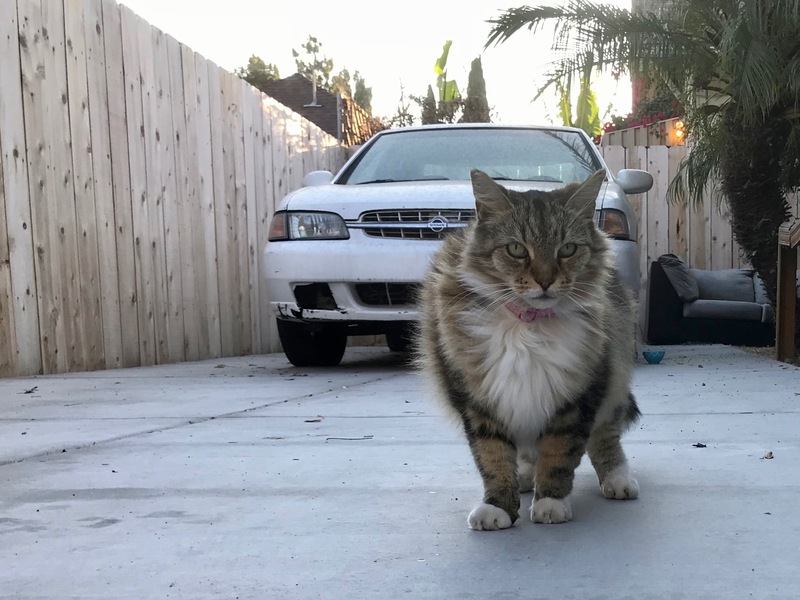 Her face shares similar features, but mitten paws and spectacular white ruff easily distinguish her from the neighborhood’s pride. I am amazed how many people know, or know of, the missing kitty. Feeling kind of glum about mum, and so not planning to photograph cats, I didn’t take along Leica Q; Sophie’s portraits are iPhone 7 Plus concoctions. The long-hair appears to have fairly defined driveway territory, which she freely accesses at will from a pet door. I shot the Featured Image at 6:42 p.m. PDT. Vitals: f/1.8, ISO 20, 1/241 sec, 3.99mm. Sophie suddenly startled and bolted upright, when someone inside the house turned on a hairdryer. That created unexpected opportunity to portray her magnificent, white ruff. The second portrait’s vitals are identical, except for 1/272 sec shutter speed. Side note: I run iOS 11 developer beta on my iPhone (5th tester build released today). Starting on mom’s birthday, July 14th, all camera captures from the smartphone are HEIF (High Efficiency Image File Format) and not JPEG. Nifty: dragging an image out of Apple Photos to Finder folder automatically converts to the older, widely-used format. Update Sept. 13, 2017: Sophie and her owner have moved. I hadn’t seen the kitty in her driveway for more than a week. The perennially parked car disappeared around the same time, when also the pet door stayed close. This morning, I saw two men in suits—property-management types—standing outside the cottage duplex. This evening, I see that the 2-bedroom, 1-bath dwelling is listed for rent; yours for $1,995 per month. Also in this series: Scruffy, Roly Poly, Woo, Skull, Biscuit, The Colonel, White, Chipper, Frisky, Stretch, Needy, Farfisa, Mates, Hunter, Pee-Pee, Blue, Blue Too, Bonded Pair, Patience, Fess, Jumper, Frenemy, Looker, Cozy, Scout, Lurks, Skit, Mini, Betty, Black and White, Stalker, Bell, Chill, Sammy, Scratch, Poser, Star, Grey and White, Watcher, Herman, Comet, Roman, Willow, Chub, Nimbus, Watson, Lilo, Kit, Pepe, Twilight, Sebastian, Spot, Booger, Ash, Veruca, Riley, Mellow, Bonde, Flower, Glass, Black, BeBe, Fang, Bruce, Siamese, Pounce, Tortie, Haiku, Fraidy, Peso, Daniel Tiger, Dusk, Stride, Dainty, Spry, Tabby, Betty Too, Still, Levi, and Shadow.